A football match to honour a soldier from Cleethorpes who was killed in Afghanistan has been held to raise money for injured troops. 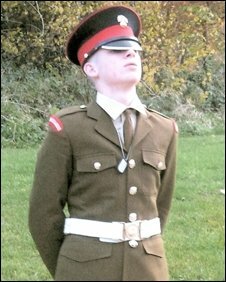 Guardsman James "Jimmy" Major, 18, a gunner with the 1st Battalion Grenadier Guards, was killed on 3 November. The match was at Grimsby Town's stadium between members of his old school in aid of Help the Heroes. Rob Allenby, head of PE at Lindsey School, said it was a fitting tribute for the soldier who loved football. Guardsman Major was a season ticket holder at Blundell Park. Mr Allenby, who helped organise the event, said: "I taught Jimmy for five years and he was a massive football fan. "This is a fitting way for people to pay tribute to Jimmy." Guardsman Major was one of five soldiers shot by an Afghan police trainee at a checkpoint in Helmand Province. He was posted to Southern Afghanistan in April 2009, six months after joining the 1st Battalion. The Ministry of Defence had said Guardsman Major had "begun to shine" and his death had brought a "tragic and abrupt end to such a short career".